I first heard about this local author when we scheduled her to do a Writer’s Workshop as part of the 2007 Adult Summer Reading Program. I read her book Hazardous Duty before the workshop and really liked it. I have been reading her books ever since. Her books have won or been nominated for several awards, including winning the 2009 Daphne du Maurier Award for Excellence in Suspense & Mystery. Christy is a writer of clean mystery and romantic suspense books that usually include some aspect of faith. Some of her books take place right here in our own area. Her Squeaky Clean Mysteries Series is an example of this. Gabby St. Claire, the protagonist, resides in the Ghent section of Norfolk. She lives in an old Victorian home that has been converted into five apartments. Her travels take her throughout South Hampton Roads. I like it when I read a book and recognize neighborhoods, street names, places, etc. that actually exist. Family problems force Gabby St. Claire to drop out of college with only one semester left, squelching her dream of a career in forensic science. In order to stay somewhat close to the field, she starts her own crime scene cleaning business. While cleaning up after a murder in a posh Virginia Beach home, she discovers a piece of evidence the authorities overlooked. Gabby believes police arrested the wrong person. She is dismayed when the police don’t give her discovery much credence and don’t want her help. Crime scene cleaner Gabby turns private eye as she attempts to see the real culprit behind bars. Easier said than done, since the real murderer obviously does not want that to happen. Gabby’s life is in danger, but she doggedly continues in her quest for justice. But the truth will surprise even Gabby. While all of this is going on, Gabby is dealing with the quirky cast of characters in her apartment building. We are introduced to her best friend, animal right’s activist and vegan, Sierra, who among other things, feeds Gabby brownies with nuts in them. Sounds innocuous, but the nuts are actually in the form of flour made from grounded acorns. Bill McCormick, the radio-talk show host, lives across from Sierra on the first floor and is constantly talking about his evil ex-wife. There is Mrs. Miller, aka “Mrs. Mystery”, a crime writer novelist and recluse who lives in the attic apartment. Across the hall from Gabby on the second floor is their newest neighbor, handsome Riley Thomas. Gabby can’t help but feel that Riley seems to be a bit of mystery himself. She feels he is hiding something, yet she is still attracted to him. You will learn more about each of these neighbors in this and other books in the series. Gabby is also dealing with her belief system. The scientist in her, along with present and past events, make her question the existence of God. Riley and others seem so sure of their belief that she begins to wonder if she might want what they have. This is not your typical mystery. It is liberally sprinkled with humor and wit and even a touch of romance. There are several twists in the plot. This all makes for a cozy, light read. 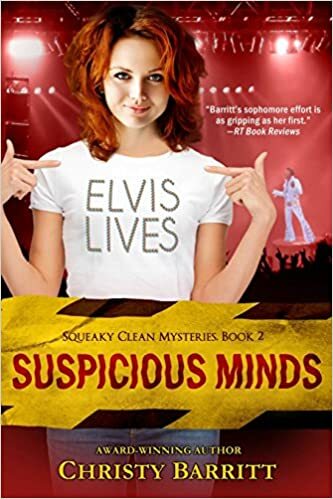 What do an Elvis-impersonator and a rival in the crime scene cleaning business have in common? Read this 2nd book in the series to find out. There are also some interesting developments in the romance department for Gabby. And her faith quest continues. Oh, and Gabby has gone back to school to finish that degree. This book won the 2009 Daphne du Maurier Award for Excellence in Suspense and Mystery. In this 3rd book in the series, Gabby’s best friend, Sierra, is accused of murder in an eco-terrorist attack and has disappeared. It is Gabby herself who has found evidence that implicates Sierra, but will not rest until she finds her friend and proves her innocent. While doing so, Gabby once again puts herself in danger on several occasions. Gabby is also dealing with some news about her own family. And is what she has with Riley the real thing? What part will her newfound faith play in her life? If you still need more Gabby, subsequent titles in this series are available in print and/or e-book format from places such as amazon.com or bn.com. Some of the other books in the series still take place right here in our area, while others will take Gabby outside of Virginia. There are also several other books by this author, Christy Barritt, available for checkout at CPL in both print and e-book formats.